Bright lights flood Pittsburgh’s sports stadiums at night, but Jordan Miller of Washington, Pa., said the real action is on the rivers. 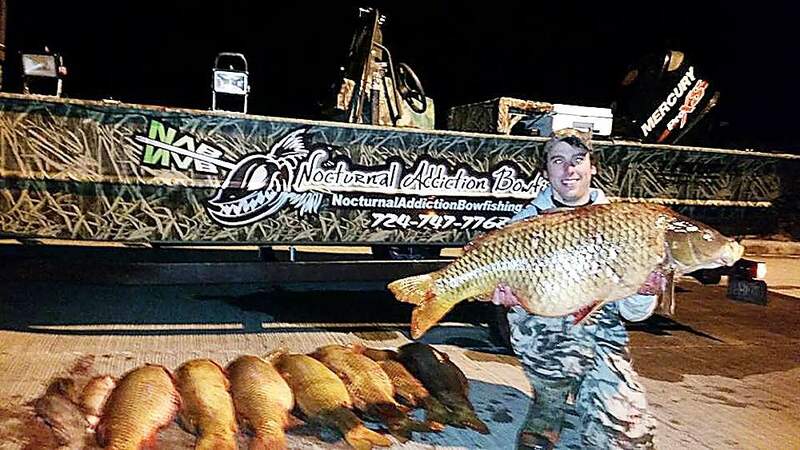 Admittedly “addicted” to the nighttime hunts since middle school, Miller launched Nocturnal Addiction Bowfishing, one of Pennsylvania’s few guide services specializing in bowfishing, and the only state-certified bowfishing charter in western counties. On Easter Sunday at Youghiogheny River Dam, the new company’s profile got a boost when Miller speared a 43-inch, 49-pound 11-ounce common carp, setting a state record certified by the Bowfishing Association of America. The fish was just a couple of pounds shy of the overall Pennsylvania carp record set in 1962. Miller takes his clients out mostly at night, mostly in Pittsburgh on the Allegheny, Monongahela and Ohio rivers. Miller motors clients into position with a 115-horse power outboard and trolling motor on a custom built extra-wide flat-bottom 20-foot bass boat totally tricked out for bowfishing. A raised platform with safety rails allows up to four bow anglers to get a better angle. Below them, the fish reflect an amber glow under 16 high-pressure sodium lights powered by an onboard generator. Clients need a fishing license, archery experience is not necessary. Nocturnal Addiction provides the gear, including small, lightweight crossbows with a low draw weight. State law permits bowfishing for carp, catfish and suckers only, and not in special regulation waters or stocked trout waters during the closed season. The best time of year is now, Miller said, when waters are approaching 60 degrees and big bronze carp are spawning in the shallows of rivers and lakes. Bowhunters accustomed to waiting motionlessly for deer will appreciate the fast action of bowfishing. Most shots, he said, are taken within 10 feet. In a short training session at the start of each charter, clients are taught to aim 10 inches low to compensate for the water’s refraction of light. Nothing is wasted on Nocturnal Addiction charters. When clients don’t want to keep the harvest, Miller donates it to the Animal Rescue League Wildlife Center, a nonprofit facility in Verona that rehabilitates injured wild animals. Nocturnal Addiction Bowfishing clients get five hours on the waters off Pittsburgh’s nightscape for $125. No charters will be booked July 8-10 when Miller will be in Memphis competing in the U.S. Open Bowfishing Championship on the Mississippi River. Nocturnal Addiction Bowfishing, www.nocturnaladdictionbowfishing.com, 724-747-7768.